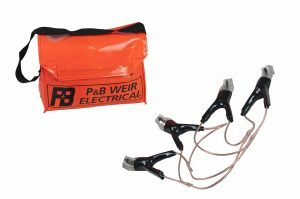 The P&B Link Box (Switching Point) Earthing Kits are available for a range of designs and are used whilst maintenance, electrical diversion or cable testing is undertaken. Comprising of 4 CE80 Sprung loaded insulated Bronze clamps connected by flexible Copper stranded cables. To be used for Link Box earthing whilst main earthing kit is applied. 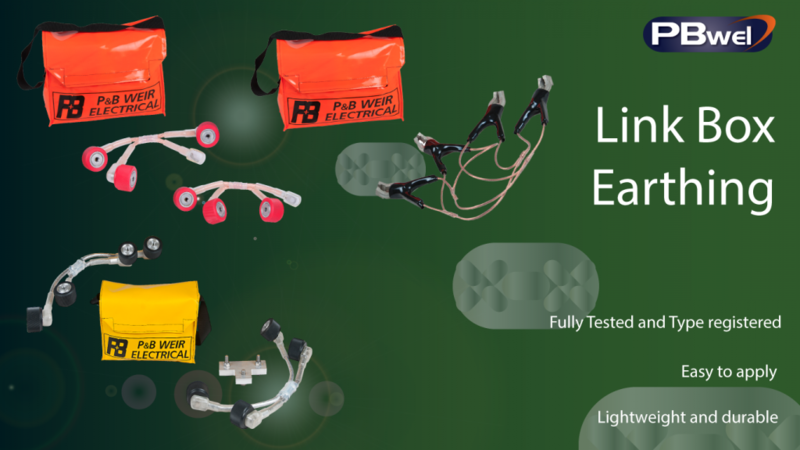 The Link Box Earthing Kit is used upon underground Earth Link boxes (modern metric type). 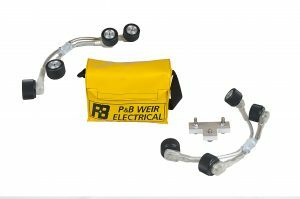 The kit is denoted by black handles and M12 threaded aluminium clamps. Supplied in a fluorescent yellow fabric reinforced PVC carrying bag for easy and safe handling. The kit also includes a temporary earth junction plate. For use on traditional underground ‘Diving Bell Style’ imperial link boxes. The kit is denoted by red handles and 1/2” BSW threaded copper clamps. 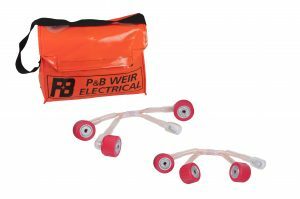 Supplied in a fluorescent orange fabric reinforced PVC carry bag for easy and safe handling. CE80- Current rating: 150A/5mins. Short circuit rating: 4.9kA/1s. Insulation rating: Typically 2kV/1min Conductor size: 1-1/2″ x 1/2″ nominal. Product No: EFU-19311. CE78/A- Continuous current rating: 150A. Short circuit rating: 7.8kA/1sec. Insulation rating: Typically 2kV/1min. Product No: EFU-19309. CE78/C- Continuous current rating: 150A. Short circuit rating: 8.0kA/1sec. Insulation rating: Typically 2kV/1min. Product No: EFU-19310.